One thing I have learned as a teacher, kids really do say the darndest things! Recently my Kansas History class started in on Bleeding Kansas, and I realized that very few of my students had retained any prior knowledge on the subject. To get the students interested in the topic, and to provide them with some basic knowledge before we really got started on the topic, I planned a pre-reading strategy using key words from the Bleeding Kansas chapter in our Kansas Journey textbook. I listed 10 key words across the board using a mixture of vocabulary, people, and places such as John Brown, border ruffians, and popular sovereignty. The students then skimmed through their textbooks looking for facts about each word which they would then write on the board. It didn’t matter if someone had already written the same fact, because the activity was about each student being able to find at least one fact not the class as a whole finding several different facts. After writing their fact the students would browse the others facts that had already been written on the board for that word, and then would return to their seat and keep skimming until they found another fact to add. By the end of the day I had 70 facts written for each of the 10 words and the students had a reference item that could be used throughout the unit to refer back to when one of the 10 words would come up in a lesson. We then took the activity a step further and I had the students pretend to play the role of someone involved in Bleeding Kansas. They could be an abolitionist, border ruffian, free-stater, or jayhawker, and they had to take on the mindset of that person while completing a writing prompt. Each student had to write about their opinions on slavery, what they wanted to see happen in the Kansas territory, and how they felt about the other three groups of people involved in the event. After my first class period was finished with the writing prompt I had them get together with the other students that selected the same role and they discussed their opinions and then shared them with the class. What I intended to be used as an informal assessment of their work quickly turned into a very heated debate about which group was doing enough to prevent slavery and the moral issues surrounding the actions of some of the groups involved in Bleeding Kansas. After I realized where the students wanted to go with this activity I restructured the discussion and let them have a formal debate about their opinions on the matter. I even had three students throughout the day play devil’s advocate and pretend to be border ruffians and argue for slavery to be allowed in the Kansas territory. 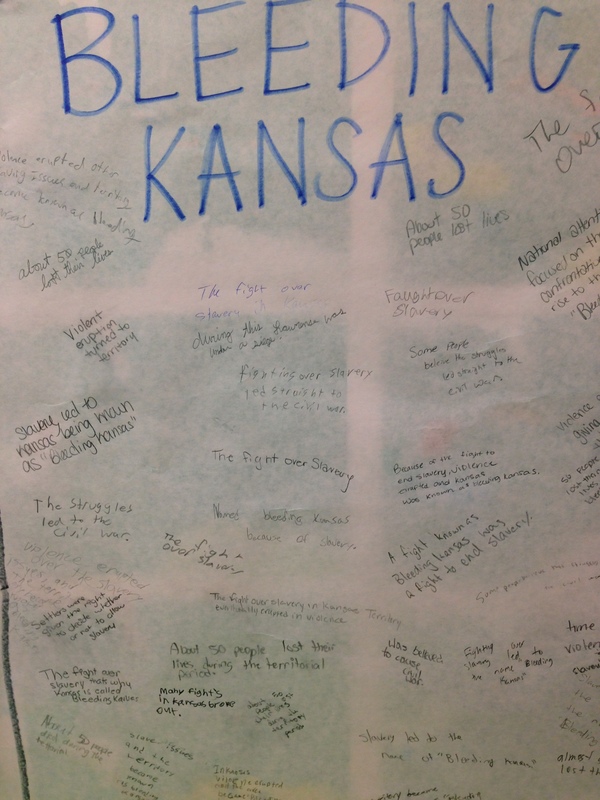 By the end of the activity the students were engaged and excited to keep learning about Bleeding Kansas, and I didn’t have a single complaint when I decided to not collect or grade their writing prompts (“Is this for a grade?”)! Welcome to Doing Social Studies! 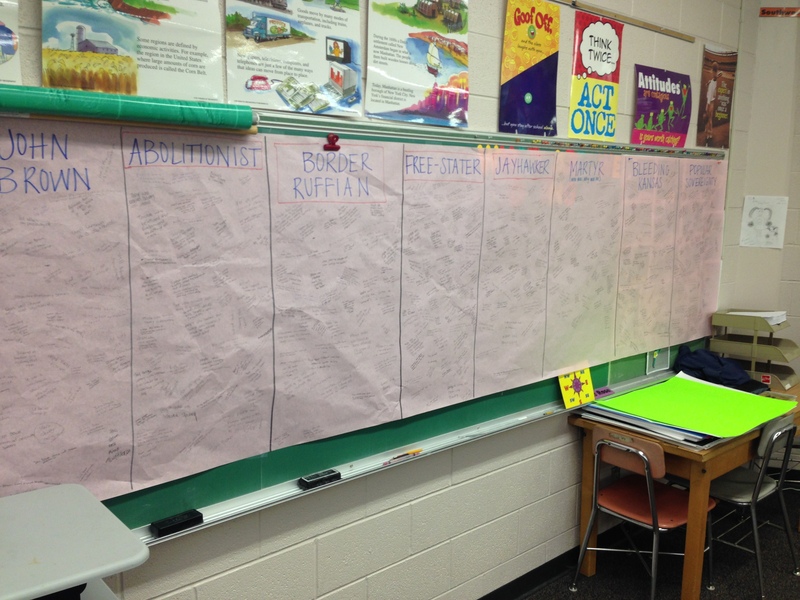 Doing Social Studies is maintained by members of the Kansas Council for the Social Studies. It's a place for a variety of voices to discuss what high-quality social studies looks like in the 21st century. KCSS board members and other educators from around the state will share ideas, resources, and materials about how we can all do social studies better. Doing Social Studies will replace the Sunflower Social Studies newsletter and will allow us to provide information in a timely and efficient manner all year long. We'd love for you to join the conversation by leaving your own ideas and suggestions in the comments.